Zak Tools Mini Entry Tool with Pike ZT48 » Protective Solutions, Inc. The Haligan Tactical Entry Tools are designed for use by law enforcement and fire/rescue personnel for accomplishing forcible entry into buildings, vehicles and other locked enclosures. 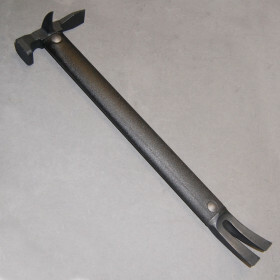 The 23” Mini Halligan Tool has a unique hammerhead/flat wedge combo made for battering, door breaching, and all kinds of lifting, prying, pulling, or puncturing The additional curved side pike is designed for quick removal of lock hasps, security screens, and whatever else stands in the way of a rescue. Also available Without Pike.